25 April was a special day because the Philharmonic Society of Gaiole performed in the rooms of our Wine Shop. It was a real pleasure to host them and enjoy the concert. To tell the truth, it wasn’t only a concert but an outstanding event that attracted so many people there wasn’t room for all of them to be seated. 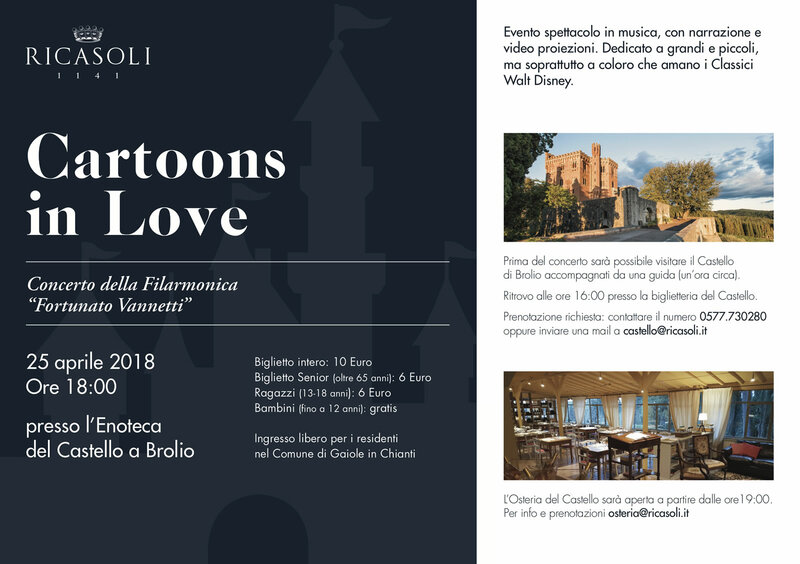 The name of the event was Cartoons in Love and it began with a guided tour of Brolio Castle. At the end of the tour, the guests found places – the lucky ones sitting down! – and the orchestra performed under the direction of the conductor, Riccardo Tonello. The musical passages played were all famous pieces from Disney, alternated with narration by Laura Celesti, who read passages from Pedro Salinas based on the importance of dreaming. “Don’t reject dreams because they are dreams. All dreams can be reality, if the dreaming does not end …” were the words that began the afternoon of music. Hosting the Philharmonic Society was a great pleasure because it is truly part of the history of the town of Gaiole in Chianti. Founded in 1865 by a local group of music enthusiasts, some self-taught, it continues welcoming new musicians. These local talents show how much ongoing musical growth there can be while never forgetting long-past origins. At the end of the concert, the mild temperatures of the beautiful day led us to end the celebration at the Agribar Caffè.